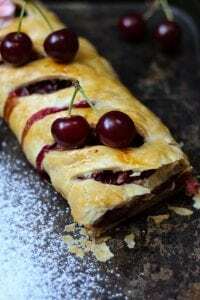 Cherry roulade on puff pastry. If you want to make a sweet cake to go with coffee and you want something simple but still delicious, then go for puff pastry-based cakes. Puff pastry from the store shelves is a godsend for many home cooks. You shouldn’t always have to get tired and bake for hours to make a tasty cake. 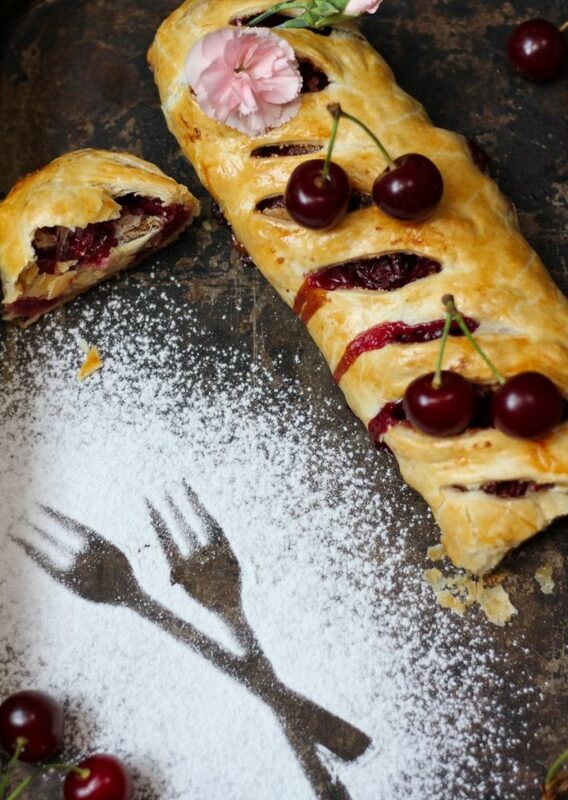 Puff pastry goes very well with fruits. At this point of the year, there is still a great selection of them available. You can go for strawberries, raspberries, rhubarb, cherries, sour cherries or berries. I decided on cherries. Ingredients you need for making cherry roulade. 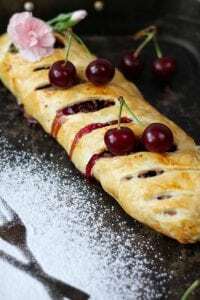 How to prepare cherry roulade on puff pastry. Take out the puff pastry from the box and roll it out. Then cut it into two parts. Wash the cherries and take out the seeds. Add sugar, flour and semolina to the cherry. Mix thoroughly. Beat an egg with a fork and brush the edges of the pastry with it. Split the cherry filling into two halves. Cover half of the pastry sheet with the first half of the filling. Start rolling the pastry from one side – the other side is, empty so it will be easier to roll it. After placing the cherry filling on both parts of the puff pastry and rolling them up, top with beaten egg and lightly cut them across with a knife. Place the roulades on a baking tray lined with baking paper. Bake in an oven preheated to 180 degrees Celsius for 1 hour and 25 minutes. What you need to know when making fruit roulade. The cherry filling should be spread only on one half of the puff pastry sheet. Do not roll the pastry with too much force, do not squeeze it. Roll them gently by putting the empty part on the part with the filling. The two parts should overlap each other on the bottom. Do you like fruits? If yes, then try our recipe for Sponge apple cake with whipped cream.